And yet, another pleasant surprise! Just as I thought that the glittering event of the Panama launch [»] was stellar enough, stirrings in the other side of the world bode of similarly interesting happenings! Our friends of Abaca India [»], has invited us to the launch of our designs in her furniture shop and showroom located in Mumbai (Bombay). This will be on the 9th of October 2008. 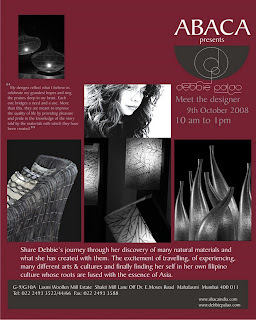 Elle Décor India will be there, and I will conduct a designers' forum/ workshop in one of Mumbai's architectural universities. We will also be visiting the charming artisan city of Kutch in the Gujarat region, to look at their beautiful and world-renowned products. I don't think I could get any more excited than this! Definitely the daily grind of the workplace is tinged with just the right kind of anticipation and excitement, and I am having my niece and assistant, K, help me with my presentation. Fortituously, this will coincide with the celebration of the Diwali Light Festival [»] in India. I am hoping for––literally and figuratively––an even brighter afterglow in the form of design inspiration and brilliant discoveries where material and material sourcing, handling is concerned. Nobody has left India without emerging with some sort of "enlightenment," artistically or otherwise; the Beatles are a famous example. I am excited to find out what India has planned for me. Last weekend was a rest day for most of the world, but was a field day for me! 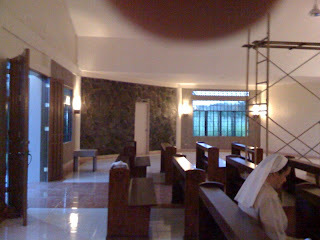 I wouldn't want to call it 'work' because, first and foremost, this is an honour for me to see to the designs of the house of the Great Designer, and second, because the location of the novitiate of the Capuchin Tertiary Sisters [»] in Talisay, Bacolod, is in the middle of the most peaceful place in the world. With my staff of two and the kindly nuns, we finally set up the interiors. 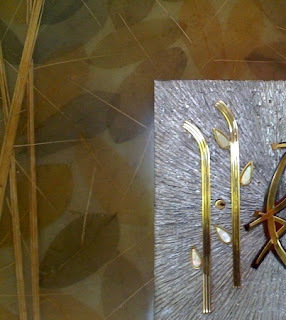 Below is an inlay detail of one part of the fixtures. This wall/ lighting installment is of fiber glass, and lights up with warm yellow lights from behind. The leaves, reminiscent of the MaiTai collection [»], are meant to evoke security and peaceful seclusion, as how canopies of trees serve as demarcations of solace from the world. Well there's another week, and the Mumbai Project to look forward to! A little tired from the very long land trip from the novitiate site (2 hours to the dock, 2 hours travel over sea via barge, and another 2 hours to ride from the port in Bacolod, to the rural area itself), but it's nothing coffee and looking at production runs can't fix! As promising as it seems to be, and as diligent as everyone else involved is, there are still loose ends that need to be covered, financially. Whatever little the sisters can receive in terms of donation is very much welcomed. There have been a few snags––after all, these are expected given it is a long-range progress monitoring––but always a challenge that presents itself even in desing: how can this problem be solved?